A University of Cambridge student has been found dead in a ditch in Cairo after being tortured and killed. Giulio Regeni, 28, disappeared in the Egyptian capital on 25 January, sparking desperate efforts by friends and family trying to trace him. His body was found nine days later by the side of the Cairo-Alexandria road on the outskirts of the city with multiple stab wounds and cigarette burns. Ahmed Nagi, a prosecutor leading the investigation into his murder, said the cause of death was still unconfirmed but that "all of his body, including his face" had bruises, cuts and burns from cigarettes indicating torture and a "slow death". Another person with knowledge of the case told the Associated Press that Mr Regeni’s body, which had been identified by his flatmate, was "partially burned". He had been studying for a PhD with the department of Politics and International Studies at Girton College, Cambridge, and was a visiting scholar at the American University in Cairo (AUC). 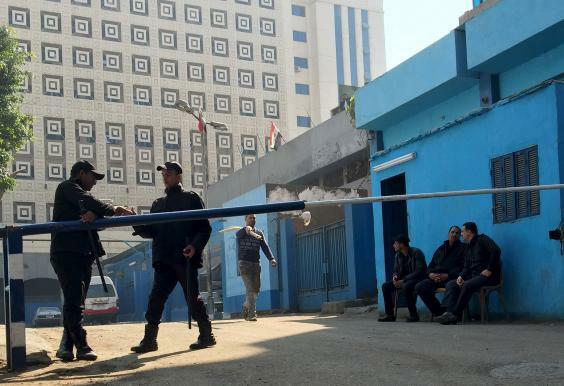 Policemen guard in front of a morgue where the body of an Italian Giulio Regeni is kept in Cairo, Egypt, February 4, 2016. Italy's Foreign Ministry said it has urgently summoned the Egyptian ambassador over the death, seeking maximum cooperation in the investigation. A spokesperson said Italy has renewed its request to launch an immediate investigation including Italian experts, and to have Mr Regeni’s body returned as soon as possible. Alaa Azmi, the deputy head of criminal investigations in nearby Giza, confirmed “bruises and cuts” were found but initially claimed the injuries were the result of a road accident. "We have to wait for the full report by forensic experts. But what we know is that it is an accident," he said. Mr Regeni’s disappearance came as police launched a crackdown on dissent and protests planned to mark the five-year anniversary of the January 25 Revolution, when Hosni Mubarak was toppled during the Arab Spring. Cairo was described as a “war zone” during clashes between pro-democracy protesters, police and the armed forces, before Mubarak stepped down and a military junta ruled until democratic elections saw the Muslim Brotherhood take power under President Mohamed Morsi. Mass protests broke out against his rule, following opposition from secularists and the military and former defence minister General Abdel Fattah El-Sisi led a coup d’etat that led to him being elected as President in 2014. He has since presided over an unprecedented crackdown on both Islamists and secular opposition, while an Isis insurgency in the Sinai Peninsula has been linked to suicide bombings and attacks in Cairo.